There are four basic styles. Click on picture for bigger image. The Zoot is a high waisted pleated trouser, taken from an original 1940's pattern, it has a fish-tail back, drop belt loops and is usually worn with braces. The Zoot has long been popular with dancers. The Peg is similar to the Zoot, but doesn't have the fish-tail back. The Oxford is a classic english trouser taken from an original 1930's pattern. 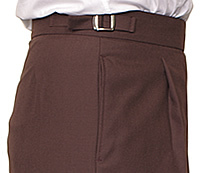 It is high waisted, has a waist band and a single pleat. The Slims are based on an original 1960's pattern and come with either a frog mouth pocket or a side/angle pocket. 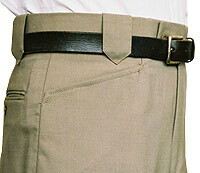 The slims also have an option of side adjusters or belt loops, and are also available with slight flare. 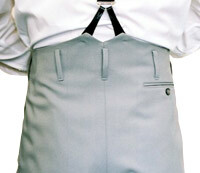 Other trouser options are available so if you have a design idea you'd prefer, then please call to discuss possibilities. Prices from: Wool £155, Wool/Poly £125, Poly £95.